The development of Crook 1851-1901. The Industrial Revolution of the 18th and 19th centuries had a massive impact. The landscape was transformed and the way in which people lived and worked underwent a fundamental change. We are going to look at some of the effects of this change by using the area around Crook in Co. Durham as an example. At the beginning of the 19th century Crook was just a tiny village lying about ten miles south-west of Durham city. According to the 1801 census it had a population of 193. However, by 1851 Crook's population numbered 3946 and by 1901 it had reached over 11,000. What caused this dramatic expansion? The answer is very simple - coal. The first coal mine in the area was opened in 1844 and several more pits were sunk in the 1850s and 1860s. Not only did the mines employ hundreds of men, women and children, but a whole host of other industries and services also developed in the area. 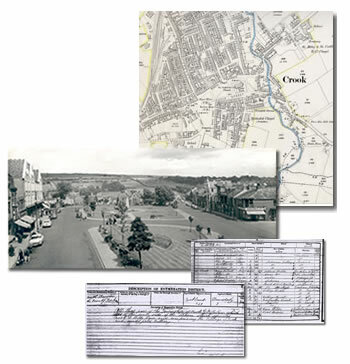 Using locally available sources such as the census, maps and trade directories, we are going to take a closer look at how and why the area around Crook developed, focusing in particular on the impact it had on population growth, urbanisation and migration. You can work through the investigation in order or use the navigation tools at the top or left-hand side of the page to go to the section you are interested in.